Andy Carroll came on to score the winner as West Ham recorded their first Premier League victory in two months by fighting back to beat Southampton. Saints dominated the first half and went ahead when Dusan Tadic's prodded effort deflected in off Carl Jenkinson. Michail Antonio levelled in bizarre fashion when a clearance hit him and looped in, before Carroll struck. 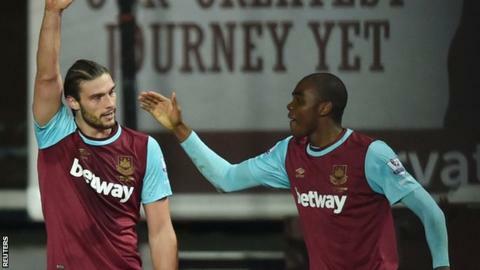 The West Ham striker made amends for a terrible miss by heading in from close range after Antonio had hit the bar. Victory was the Hammers' first since a 2-1 win at home to Chelsea on 24 October, when then Blues boss Jose Mourinho was sent to the stands. Slaven Bilic's side move up to seventh in the table, while Ronald Koeman's Saints, who beat Arsenal 4-0 at home on Boxing Day, stay 12th. After drawing for a fifth time in a row on Saturday, Hammers boss Bilic bemoaned the injuries to his key attacking players. Carroll and Manuel Lanzini made their returns as second-half substitutes on Monday, but the Croat is still without Victor Moses, Dimitri Payet, and Diafra Sakho up front. Having scored just four times in their previous eight games, the comeback looked far from likely, but West Ham transformed the match through a second-half performance that was a world apart from their poor opening to the game. There was a huge element of fortune about Antonio's equaliser, but it was deserved for the number of chances the home side created after the break, with Carroll missing the most clear-cut when earlier blazing over from six yards out. The way Southampton started the match made you think they had finally turned the corner and rediscovered the kind of form that saw them finish seventh last year. Koeman's side had picked up only one point from five league games before Saturday's demolition of Arsenal at St Mary's and that result had clearly given them confidence. In the first half Saints had zip and zeal in midfield, were solid at the back, and created chances aplenty through the running of Shane Long and Sadio Mane up front. But if the away side were far superior in the opening 45 minutes, the opposite was true in the second half as the introduction of Carroll and Lanzini turned the match in the Hammers' favour. The West Ham winger got his first Hammers goal to draw his side level, and almost had a second when heading onto the underside of the bar. West Ham boss Slaven Bilic: "After the goal we were totally down and I waited for half-time because I didn't want to humiliate the players by changing them before. I was happy when the referee blew, because they could have been 2-0 up. "At half-time we made some changes but it was a change of character, of approach, of determination and will. They did try in the first half, but this was a different West Ham. "We equalised and continued to chase, and at the end of the day we were rewarded for everything we did in the second half." Southampton manager Ronald Koeman: "The second half was totally different to the first. We had to score more than one in the first half, because otherwise you expect their reaction in the second. If you score only one they still have belief. "The first half was the level of the Arsenal game. It was one team on the pitch playing football. But out of a better second half they scored two goals, and from a fantastic first we scored one. "If you are the dominant side you have to score more than one goal, and that was the problem." West Ham play Liverpool at home in a 12:45 GMT kick-off on Saturday, when Southampton travel to Norwich for a 15:00 start. Match ends, West Ham United 2, Southampton 1. Second Half ends, West Ham United 2, Southampton 1. Attempt missed. Virgil van Dijk (Southampton) right footed shot from the centre of the box misses to the left. Attempt missed. Michail Antonio (West Ham United) right footed shot from the centre of the box is high and wide to the right. Assisted by Carl Jenkinson following a fast break. Corner, Southampton. Conceded by James Tomkins. Substitution, West Ham United. Pedro Obiang replaces Enner Valencia because of an injury. Offside, Southampton. Ryan Bertrand tries a through ball, but Juanmi is caught offside. Corner, Southampton. Conceded by Angelo Ogbonna. Goal! West Ham United 2, Southampton 1. Andy Carroll (West Ham United) header from very close range to the top left corner. Michail Antonio (West Ham United) hits the bar with a right footed shot from the centre of the box. Attempt missed. Steven Davis (Southampton) right footed shot from outside the box misses to the right following a corner. Attempt missed. James Tomkins (West Ham United) right footed shot from outside the box misses to the left following a set piece situation. Substitution, Southampton. Juanmi replaces Sadio Mané. Substitution, Southampton. Gastón Ramírez replaces Dusan Tadic. Attempt saved. Enner Valencia (West Ham United) right footed shot from the left side of the box is saved in the bottom left corner. Assisted by Mark Noble. Corner, West Ham United. Conceded by Maya Yoshida. Attempt missed. Manuel Lanzini (West Ham United) right footed shot from outside the box is close, but misses to the left. Assisted by Enner Valencia. Substitution, Southampton. Maya Yoshida replaces Cuco Martina. Goal! West Ham United 1, Southampton 1. Michail Antonio (West Ham United) header from the centre of the box to the top left corner. Attempt saved. Steven Davis (Southampton) left footed shot from long range on the left is saved in the top right corner. Corner, West Ham United. Conceded by Steven Davis. Attempt saved. Oriol Romeu (Southampton) right footed shot from outside the box is saved in the centre of the goal. Assisted by Sadio Mané. Dangerous play by Dusan Tadic (Southampton).